Hello Friends, when you’re heading out for brunch with hubby or lunch with the ladies do you find choosing just the right thing to wear a daunting task? Do you open your closet door, stare inside and say, “I have nothing to wear?” Well when hubby and I decided to head to Aqua Sol for Sunday Brunch, I knew exactly what I was going to wear. 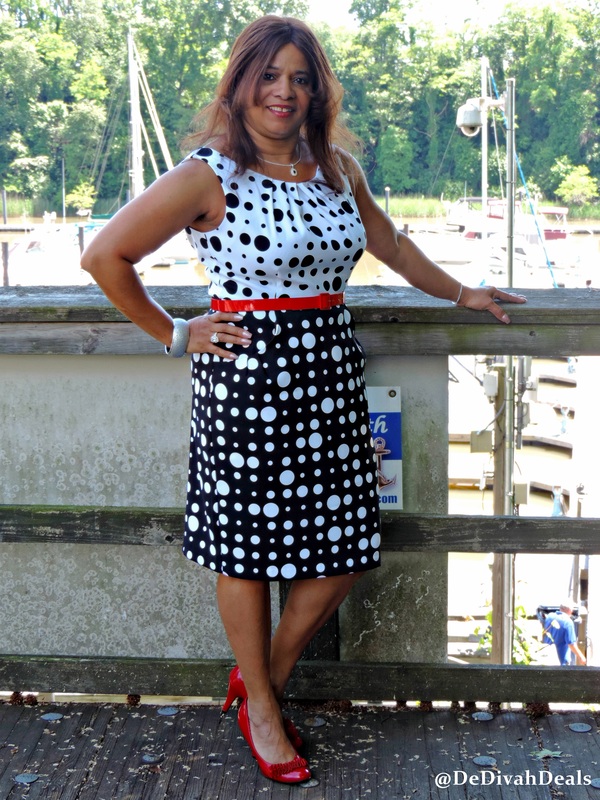 This Polka Dot Sheath dress from Midnight Velvet was perfect for an afternoon at the Marina. Sleeveless with a side zipper made it comfortable enough for sitting in the sun and the polyester/spandex blend made it stretchable enough to enjoy a meal without it being too tight afterwards. I chose to wear my “caliente” pumps to match the red belt which gave it more of a colorful pop. As part of Midnight Velvet’s Summer 2014 catalog this dress is definitely a confident summer style with pizzazz. The side pockets were a nice added feature and perfectly sized to drop in my cell phone. Now to assist you with the “I have nothing to wear” dilemma, Midnight Velvet has offered to give one of my lucky readers at $50 Midnight Velvet Gift Certificate. This Rafflecopter giveaway will end at midnight on June 30th, so hurry and enter today. Thank you my friend, how are you doing? Ready to get back into those heels? You look Lovely here my Sista and who dos not like pockets. . . .
LOVE this dress, sis! Very cute and the red shoes are perfect. You look absolutely beautiful, as always. Hope you had an amazing and blessed weekend. Thank you lovely lady, yes our weekend was nice, hope it was the same for you and mini me! Black, white, and a touch of red! Plus polka dots! You have my favorite outfit and it looks very nice! Thank you, Polka Dots is my favorite pattern. Ah, thank you very much and good luck! 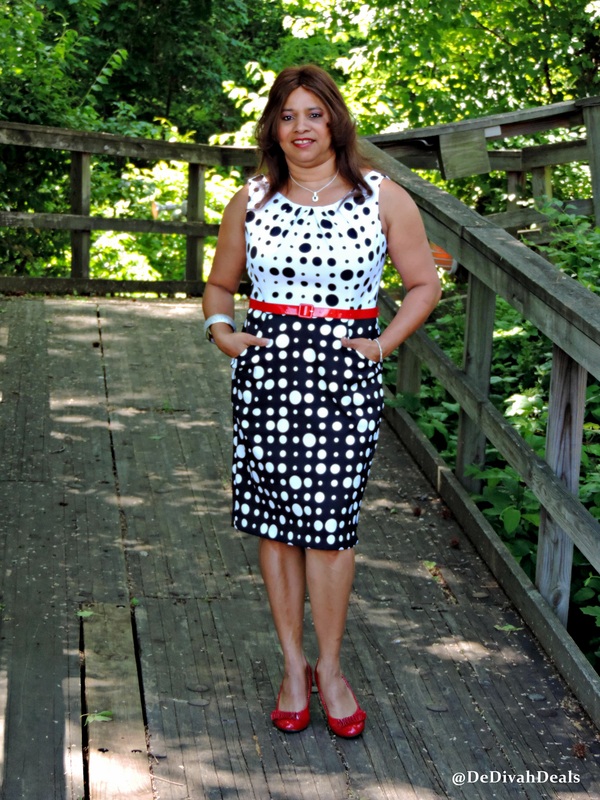 Thank you, I love Polka Dots, have you entered for a chance to win the $50 Gift Certificate? Thank you Charisse – have a wonderful Wednesday my bloggy friend! oh, I am sorry that you missed it. Did you enter to win the Summer Statement Necklace? Hope you are having a terrific Tuesday! oh – how sweet Nikki!